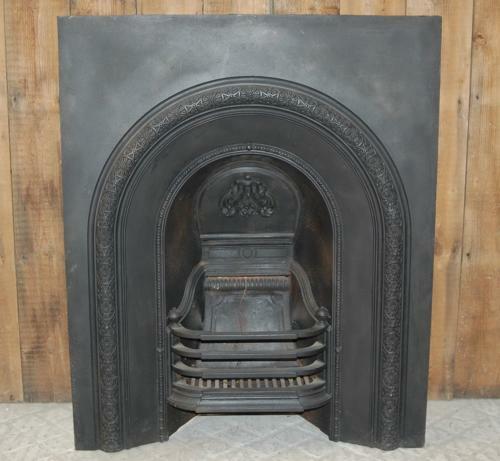 A very pretty Victorian, antique, fire insert suitable for living, dining room or a larger bedroom. The fire is decorated with a pretty flower border and beaded border that surrounds the fire opening. The smoke flap has a cast motif and the original, shaped, front bars are present. The fire has the RD number 187869, dating it to 1892. The fire has been blacked and polished and has a lovely finish. The fire is, at present, for DECORATIVE USE ONLY due to cracking and breakages to the concrete fire back. The fire back is slightly loose within the fire. The concrete can be replaced for an EXTRA CHARGE and this would enable the fire to be used. Please contact us for a quote and further information. The fire is antique and therefore has some slight signs of use and wear. The iron sides near the fire brick has some damage and bulging due to heat. Some slight marks, scratches and signs of use can be seen. The back has surface rust as expected. The fire would be wonderful in a period home, adding great character and interest to a hearth.